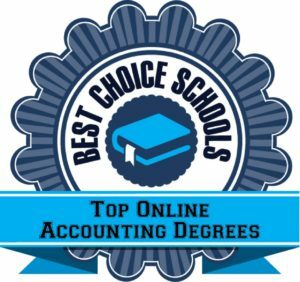 In this article we highlight the 20 best online schools for accounting bachelor’s degrees in 2016-2017. The first step toward an accounting career is earning an undergraduate degree in the discipline. Of course, finding an accredited institution with a top-ranked accounting program also helps. According to the United States Department of Labor, Bureau of Labor Statistics, the occupational outlook for accountants is extremely favorable. In fact, employment for accountants and auditors is expected to grow 11 percent over the next eight years. Anticipated demand means that colleges and universities are offering programs designed to prepare students for long-term accounting careers. Even some of the top-ranked institutions now offer online accounting degree options so that students are able to balance life obligations with education. This ranking is designed to help students identify the best schools for an online accounting degree based on methodology listed below. We examined over 100 accredited institutions that offer online bachelor’s in accounting degree programs. From the pool of schools, we examined the percentage of admitted applicants, graduation rates, and student-to-faculty ratios. We also looked at in-state undergraduate tuition and fees to determine affordability. Our data was taken from NCES College Navigator and used to help create our list of the 20 best online schools for accounting degrees (2016-2017). Online courses in Colorado State University’s online accounting school align with the standards of AICPA. Colorado Technical University is one of our top online schools for accounting. The program and school are both nationally accredited and ranked. In fact, major publications like U.S. News and World Report rank the online bachelor’s degree programs at CTU #63 in the nation. Students receive online instruction that is designed to prepare them for careers in corporate, governmental, or private sector accounting. Also, the program provides a strong foundation for those interested in pursuing graduate accounting degrees. Online courses include advanced accounting, advanced tax, cost accounting, government and not for profit accounting, introduction to international financial reporting standards, and management fundamentals. All courses align with the standards of the American Institute of Certified Public Accountants (AICPA). The accredited online bachelor’s in accounting degree from Florida Tech is for those interested in becoming a CPA. Florida Institute of Technology offers an accredited online bachelor’s in accounting degree that is designed for those who wish to pursue the certified public accountant (CPA) or certified management accounting (CMA) examination. Courses are delivered online and include accounting information systems, advanced accounting, advanced auditing, corporate federal income taxes, cost accountifloridng, principles of accounting, and strategic management. FIT is one of our top online accounting schools primarily due to affordability. Also, the school is ranked by major publications like U.S. News and World Report as a top national university. The online bachelor’s programs also rank #92 in the nation. Southern New Hampshire University’s online school for accounting offers two concentrations! Southern New Hampshire University is among our top picks for online schools for accounting due in part to the high graduation rate. The school offers an online bachelor’s in accounting with two available concentrations – accelerated or forensic accounting and fraud examination. The program is designed to equip students for entry-level accounting careers or prepare them for graduate level programs and certification exams. Courses are delivered entirely online and include advanced accounting, auditing principles, cost accounting, federal taxation, financial statement analysis and business valuation, and intermediate accounting. The school and its programs are accredited and ranked by major publications like U.S News and World Report. In fact, the school ranks as a best regional university in the North. Colorado State University-Global Campus is one of the top online accounting schools with numerous specialization options. One of the best online accounting schools on our list is Colorado State University-Global Campus. The institution offers an accredited online bachelor’s degree in accounting that is designed to equip students for careers as accountants or certification as licensed accountants. Over 15 specialization options are available so that students may customize their accounting degree. Some of the specializations include business administration, criminal forensics, data management and analysis, information technology operations, and marketing. Specialization requirements include the completion of five upper-division courses (15 credit hours). All courses are delivered online and include federal individual taxation, government and nonprofit accounting, intermediate accounting, and the legal and ethical environment of business. Want to pursue a career as a CPA? University of Maryland is one of the best online accounting schools on our list. One of the best online accounting schools on our list is the University of Maryland University College. The school offers an online accounting bachelor’s degree program that is both accredited and highly affordable. Classes are delivered online and taught by university professors who teach in the classroom. These online courses include advanced accounting, auditing theory and practice, cost accounting, federal income tax, international accounting, introduction to statistics, and principles of accounting. The program is designed to help students prepare for various accounting certifications like the certified internal auditor (CIA), certified management accountant (CMA), and certified public accountant (CPA). All programs are accredited and the school is ranked by U.S. News and World Report as a best regional university in the North. Tiffin University is a top pick for online accounting schools. Tiffin University is one of our top online accounting schools that offer an online bachelor of business administration in accounting. This unique BBA program allows students to focus their studies on accounting and prepares them for various certification examinations. Students take courses that explore a wide variety of accounting principles. All classes are delivered online and include accounting information systems, analysis of the accounting process, cost accounting, federal income tax, intermediate accounting, and managerial accounting. Tiffin is an accredited institution, and also ranked by major publications like U.S. News and World Report as a best regional university in the Midwest. Affordable tuition and a relatively high graduate rate land Tiffin on our list of the best online schools for accounting. Saint Leo’s affordability lands it a top spot on our list of best online schools for accounting. Saint Leo University lands a spot on our list of the best accounting schools online due to affordability and a low student-to-faculty ratio. The school offers an online bachelor’s in accounting degree program that is designed to equip students with the skills needed to become certified public accountants or certified management accountants. All classes are delivered online and include advanced accounting, auditing, business law, cost accounting, individual federal income taxes, and intermediate accounting. The program is accredited by the International Assembly for Collegiate Business Education (IACBE). Also, the school ranks among the best regional universities in the South and the 51st best college for veterans by U.S. News and World Report. Accredited and affordable! WSU is a top pick for our list of online schools for accounting. Washington State University is one of our top online accounting schools that is fully accredited by the Association to Advance Collegiate Schools of Business (AACSB). The school offers an online bachelor’s in accounting degree program that is designed for working or busy students who want to receive the foundation in accounting needed to pursue employment or professional certification. Classes are delivered entirely online and include accounting systems and auditing, auditing, cost accounting, intermediate accounting, and introduction to taxation. WSU is accredited by one of the leading accrediting bodies and ranked by major publications like U.S. News and World Report. In fact, the most recent edition of Best Colleges ranks the school’s online bachelor’s programs as #34 in the nation. University of Minnesota is one of our top picks for accounting schools online due in part because of the small class sizes. For those looking for accredited and ranked online schools for accounting, the University of Minnesota provides an affordable option. The online bachelor’s in accounting degree program offers small class sizes and individualized attention. In fact, the low student-to-faculty ratio is one of the reasons the school lands on our list. All classes are delivered online and include accounting systems, auditing, cost accounting, income tax, managerial finance, and principles of accounting. Curriculum is identical to the on-campus accounting program, and classes are taught by the same university professors. Also, the online bachelor’s programs rank #63 in the most recent edition of Best Colleges by U.S. News and World Report. Clarion University’s affordable tuition earns it a spot on our list for best online schools for accounting. Clarion University of Pennsylvania’s affordable tuition and relatively high graduation rate earn it a spot on our list of the top accounting schools online. The school offers a BSBA in accounting degree that is designed to help students succeed in securing accounting and finance positions. Online classes are small and taught by the same university professors who teach on-campus. Classes explore topics in economics and business statistics, financial accounting, financial management, managerial accounting, and problems in federal tax accounting. Clarion is accredited and ranked by major publications like U.S. News and World Report. In fact, the school’s online bachelor’s programs rank #120 in the country. Accelerated options available! Regis University is among the best online schools for accounting. Regis University is among the top online accounting schools due to its low student-to-faculty ratio and high graduation rate. The school offers an accelerated online BS in Accounting degree that is designed to prepare students with the most current accounting practices and techniques while building a strong foundation in ethics. Classes are taught online in eight-week increments. Some of the online courses include cost accounting, intermediate accounting, introduction to statistics, legal environment of business, and principles of accounting. Regis is accredited and ranked by major publications. In fact, U.S. News and World Report ranks the school as having the 92nd best online bachelor’s programs in the country. The institution also earns a #10 spot on our list of best online accounting schools. Indiana Wesleyan University offers a low student-to-faculty ratio and is a top online accounting school. Indiana Wesleyan University is one of the top online accounting schools due to the low student-to-faculty ratio and high graduation rate. The school offers an accredited bachelor’s in accounting degree program that is specifically designed for working professionals who require flexible learning options of an online program. The undergraduate degree is also designed to prepare students for CPA certification and licensing, for those interested. Courses are delivered online and taught by the same instructors who teach on-campus. These courses include accounting ethics, accounting information systems, advanced accounting, auditing, federal income tax, and managerial cost accounting. Liberty University’s online bachelor’s in accounting program ranks among the top accounting schools on our list. Liberty University is one of our top online accounting schools to offer a bachelor’s in accounting designed for working professionals. Flexible course schedules and reasonable tuition rates make the program appealing to those interested in pursuing a career or certification in accounting. Also, the program is ACBSP-accredited – a premiere governing body. Classes are delivered entirely online and include accounting ethics, accounting information systems, advanced accounting, financial accounting, managerial accounting, and taxation. Liberty’s online bachelor’s programs are ranked by major publications like U.S. News and World Report as the 100th best in the country. The school also provides access to online master’s in business programs, like the master’s in accounting degree, that are ranked and accredited. Penn State offers an online accounting program that is AACSB-accredited. Pennsylvania State University’s affordable undergraduate tuition and low student-to-faculty ratio earn it a top spot on our list of best online accounting schools. Through Penn State World Campus, busy students may earn an AACSB-accredited online bachelor’s in accounting. The AACSB accreditation is an honor given to only the top 5% of business schools worldwide. Also, the school and its online bachelor’s programs are ranked by major publications like U.S. News and World Report. The accounting program is designed to prepare students for major accounting certifications like the CIA, CGMA, or CMA. All classes are delivered online and include auditing, cost accounting, federal taxation, and financial and managerial accounting for decision-making. Auburn University is a top pick for best online schools for accounting. Auburn University’s low undergraduate tuition and high graduation rate earn it a spot on our list of top online accounting schools. The online bachelor’s in accounting program is designed for working students or those with life obligations that require them to pursue a flexible distance-learning program. Online students receive the same instruction and AACSB-accredited degree as their on-campus peers. Some of the online courses that students take include accounting information systems, auditing and assurance services, cost accounting, income tax, and intermediate accounting. Aside from accreditation, Auburn and its programs are ranked by major publications like U.S. News and World Report. In fact, many of the school’s online graduate business and accounting programs rank in the top 10. Indiana State University’s affordability makes it one of our top choices for best online schools for accounting. Indiana State University is one of our top picks for the best accounting schools online. Affordable tuition, a low student-to-faculty ratio, and relatively high graduation rate earn it a spot on our list. Students may earn an online bachelor’s in accounting that is designed to serve as preparation for the certified public accountant licensing examination. Also, for those interested in an online MBA or master’s in accounting, the undergraduate program is designed to help. Classes are delivered entirely online and include accounting systems, auditing theory and practice, cost accounting, financial accounting, and introduction to federal income taxation. The school and its online bachelor’s programs are also ranked by major publications like U.S. News and World Report. Keiser University’s high graduation rate makes it one of the best online schools for accounting. Keiser University is one of our top picks for accounting schools online because of its low student-to-faculty ratio and high graduation rate. The school offers an online bachelor’s in accounting degree program that is designed to provide busy students with flexible learning options. The online accounting program offers courses in accounting information for business decisions, accounting principles, business law, financial management, integrated accounting, and principles of taxation. Keiser is accredited and ranked by major publications like U.S. News and World Report. In fact, the most recent edition of Best Colleges lists the school as the 36th best regional college in the South. The university makes our top 5 for best online accounting schools. Old Dominion University is one of the top online schools for accounting due to its affordability. Old Dominion University is a top pick on our list of online accounting schools. The institution offers an online bachelor’s in business administration with an accounting concentration. To earn the degree, students must complete at least 30 credit hours at Old Dominion, with an overall total of 120 credit hours. Accounting courses are delivered online and include accounting information systems, intermediate accounting, managerial accounting, principles of accounting, and taxation. Old Dominion is a nationally ranked institution by major publications. In fact, U.S. News and World Report ranks the school’s business programs, including accounting, in the nation’s top 200. AACSB-accreditation and high selectivity make Northeastern University a top choice for online schools for accounting. One of the top accounting schools online is Northeastern University. The highly ranked institution offers an AACSB-accredited bachelor’s in finance and accounting management degree program designed for individuals who desire professional certification or to enter a graduate accounting program. All classes are delivered online and taught by the same experienced professors who teach on-campus. Students can expect to take business strategy, cost accounting, financial statement analysis, investments, principles of taxation, and risk management and insurance. Northeastern is ranked by major publications as a best national university. In fact, the school consistently ranks in the top 50. Northeastern lands on our list of top online schools for accounting due to the low student-to-faculty ratio, high graduation rate, and low admittance rate. Northeastern University is considered to be one of the top research institutions in the country. University of Memphis is our #1 pick for the best online schools for accounting. The University of Memphis is our top pick for best online accounting schools due to its affordable tuition, low student-to-faculty ratio, and competitive admission rate. The university offers an online bachelor’s of business administration (BBA) degree with a major in accounting, with core classes designed to serve as quality preparation for the CPA certification exam. Students take courses in accounting systems, audit and assurance services, cost accounting, federal income tax, financial statement analysis, information systems auditing and assurance, and intermediate accounting. The University of Memphis is recognized by U.S. News and World Report as a top national university. Also, the school’s online bachelor’s programs are also ranked. The school is our #1 pick for the best online schools for accounting in 2016. This concludes our ranking of the 20 best online schools for accounting degrees (2016-2017).